Controlling the cost of health benefits while keeping employees happy... In today's shifting small business health insurance market, this can be a major challenge for business owners. In the past, it seemed easier. Group health insurance was clearly the best way to provide quality health insurance to employees. But for many businesses today (especially small businesses) there's one major problem... group health insurance costs too much. For example, the average cost for one year of group health insurance in 2012 for a single employee was $5,615, up from $2,196 in 1999. For family coverage in 2012, a year of coverage was $15,745, up from $5,791 in 1999 (source: KFF). The increasing cost is not sustainable to businesses or to employees. So, it's no surprise that many small and medium-sized businesses are transitioning away from group health insurance and choosing to offer health benefits with a pure defined contribution approach. With defined contribution, the business controls all health benefits costs while providing the same (or better) health insurance coverage to employees. Your financial liability is controllable, and employees shop for policies that best meet their individual health needs. Your business defines the budget by setting any contribution amount toward employees’ health care. Typically, monthly health care allowances are provided tax-free via a Section 105 plan. Because there are no annual renewal increases or minimum contribution amounts, the business literally controls all health benefits costs. 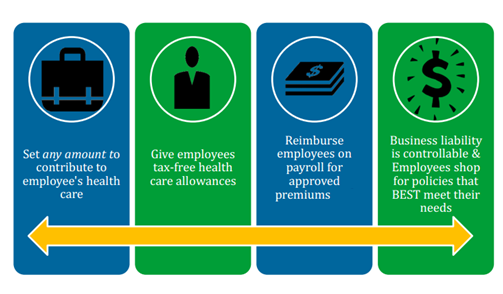 Employees purchase individual health insurance policies and submit their expense for reimbursement. Your business reimburses employees directly on payroll tax-free. With this type of approach, pre-funding of third party bank accounts is not required. Your business only reimburses employees for eligible premiums, up to the amount of their health care allowance. If an employee leaves, any unused allowance amounts stay with your business. These four aspects of a defined contribution approach give you financial control and predictability, while creating health benefits that make employees feel valued, loyal, and happy. What questions do you have about controlling health benefits costs with defined contribution? Let us know in the comments below.